By now you have probably already spent more hours than you can count doing everything you can to plan your wedding. But how much of that time have you spent planning the perfect exit? One of the latest trends in creating the perfect exit is the use of wedding sparklers. The vast majority of the wedding sparklers for sale today are inexpensive and yet they allow you to create a range of amazing images to light your way from your wedding venue. Here are a few hot tips you can use to ensure this final part of your wedding goes off beautifully. 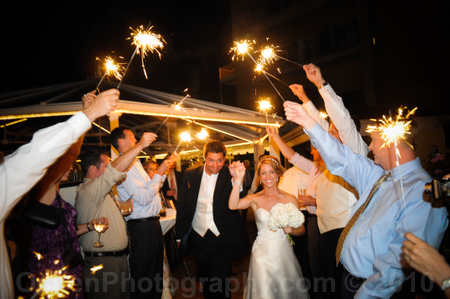 See if it’s okay to use wedding sparklers at your venue. It likely will be, but it’s always a good idea to plan ahead. There are many different types of wedding sparklers for sale. Be sure to avoid any that have paper on the outside as this will make them very smoky. A good sparkler should burn smokelessly and last up to 3 1/2 minutes depending on the size. Even after you have planned your exit down to the last detail, you need to have someone help to coordinate it. You can use your wedding event planner if you hired one, or someone in the wedding party you trust. It is important that your guests are not standing too closely together while the wedding sparklers are burning to give you room to walk and to ensure no one gets hurt. When lighting the wedding sparklers start with those that are closest to your starting point and work down the line in the direction you will be traveling. This will ensure you still have lit sparklers by the time you get to the end. You should use a windproof lighter instead of matches to light the first one and then use that sparkler to light the next one and so forth. Be sure your wedding sparklers are prominently displayed and then have an announcement made to let them know where they are and when it is time to light them. This way your guests will not only know it is time to form up and light their sparklers, but also that it is almost time for the happy couple to make their final exit from the venue. As you look at the different venue locations, be sure there will be enough room for two rows of your guests to form with plenty of space between them for the bride and groom to walk. You could always have them form a circle, but this can be more difficult to work with. Wedding sparklers are considered to be safe enough for children to use, but they do get quite hot. If you are going to allow children to use them, be sure they are properly supervised to reduce the risk of injury.